Do you have a database or storage system for your pre-WizeHive data? If yes, you may want to simply export your data and import it into your own database. Do you need to be able to refer to data from years' past within WizeHive? If yes, you may want to copy your existing workspace for the new year and turn your old workspace into an archive workspace. If yes, you may want to work with your implementation lead to copy your workspace, use the old workspace as the active workspace, and move all of last years' entries into the workspace you just created to be an archive workspace. The sections below will help to guide you in each of these processes. Most of these will require some assistance from WizeHive support or implementation, so please contact support@wizehive.com with questions. If you need to export your data in a spreadsheet format, you should utilize our Reports in order to do so. The client here created a report called "All Applicants". This report contains every field from the applicant and the review form and is run against all folders. Once you have created and run the report, you can press Export in order to export a CSV file of all of this data. The CSV will include every record, even if your report view is set to show only 100 per page. If you need to export files in their original format, you will need to speak with support@wizehive.com or your Implementation lead in order to accomplish this. They will set up an export, and the exported zip file will be accessible via the Files tab of your workspace. 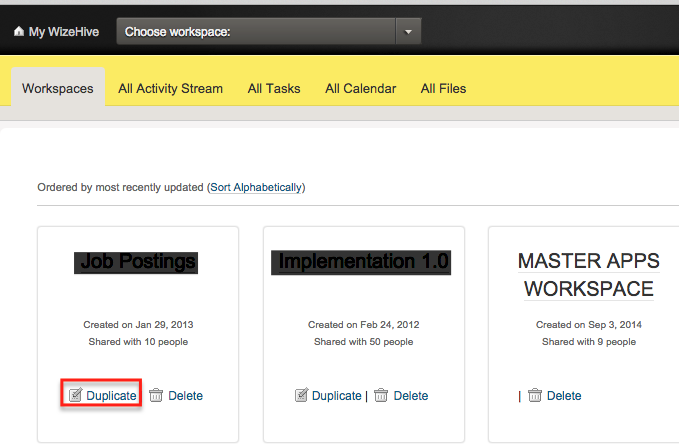 If you prefer to keep your data within a WizeHive workspace, you will need to create a new workspace. One of the workspaces will house the old data and will be called the Archive. The other workspace will be used to intake. 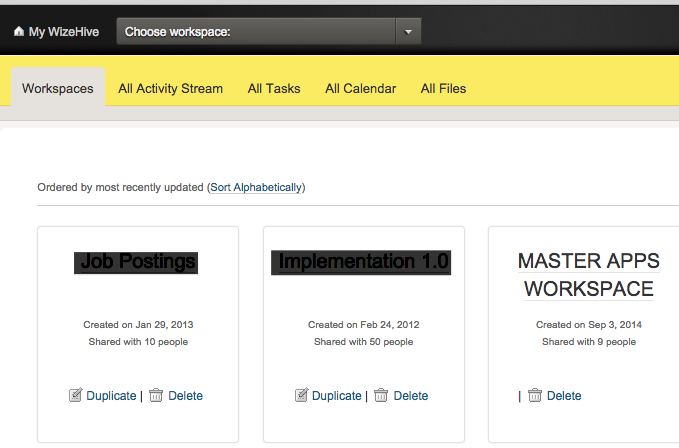 To copy your formerly active workspace, go to your My WizeHive homepage. Here you will see all of your workspaces. 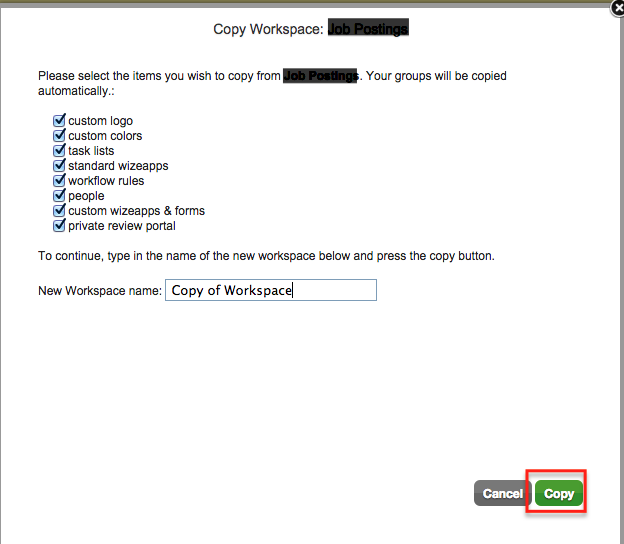 Locate the workspace in question, and click the Duplicate button. Leave everything checked off as they are by default, and then click Copy. Wait a few minutes for the copy to occur. You may need to refresh your screen or log out and log back in in order to see your new workspace. If you answered Yes to Question 3 above, please go to the next section. If your data exists in just a few folders, you can accomplish this on your own. Please refer to the article on Copying Data, and contact support@wizehive.com with questions. If your data exists in a large number of folders, you may need WizeHive's assistance to complete this task. Contact support@wizehive.com.